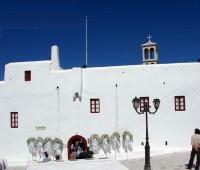 The Holy Monastery of Our Lady Tourliani was founded in 1542 by two monks who had left the monastery of Katapoliani on Paros. The island of Mykonos was totally deserted during that period, the result of a destructive attack by the pirate fleet of the notorious Hairedin Barbarossa in 1537. During this attack, thousands of the island’s inhabitants were slaughtered and, except for a handful of lucky ones who managed to escape to the nearby islands of Tinos and Paros, the rest were captured and sold as slaves in the slave-markets of the East. Five years later, with Barbarossa attacking, plundering and destroying one Aegean island after the other, the two monks acted wisely and avoided the coastline of Mykonos, as this was very dangerous. They established themselves and the monastery in the interior of the island, at Ano Mera, a site where a church dedicated to the Presentation of Virgin Mary pre-existed. They made sure that the walls around the monastery were high and castle-like; and, of the two wells on the site, one was included within the monastery's yard. Some very fertile land, that eventually became a source of income to the Monastery, surrounded the enclave. Above the relatively small entrance Gate, (small, so as to resist break-in attacks) an opening is visible, through which the monks, when attacked, could safely pour hot oil on anyone trying to break in by force. Yet, despite all defensive measures, the monastery was plundered in 1612 by the Muslim pirates, and the wooden roof of the church was burnt down. It was imperative that the church be rebuilt using fireproof materials. The monastery eventually became the center of a community of farmers, whose houses were to form the village of Ano Mera. The entire island community wished to share the safekeeping of the miraculous Icon of Our Lady (shown nursing the baby Jesus), which had been found floating in the Bay of Tourlos just outside of Chora, the main village of the island. 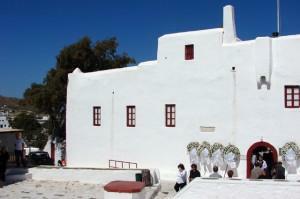 After negotiations with the residents of Chora, it was agreed that the Icon would be shared. It was to be kept in the Chora cathedral during the cold half of the year, a period crucial to the sea-faring people who wanted its protection, and would be given to the people of Ano Mera to be kept in the church of the Monastery during the warm half of the year, a period equally crucial to the farmers. Every spring, the Holy Icon is taken in procession from Chora halfway to Ano Mera, escorted by all the islanders and accompanied by local musicians, to be surrendered into the hands of the inhabitants of Ano Mera. Likewise, every autumn the ceremony is reversed, and the Icon returns to Chora. An interesting detail about the Icon is that it is not drawn on wood, but on a slab made of a mixture of wax and chewed mastic from Chios, rendering it uneatable by insects. It is believed to have been drawn by the Evangelist Luke himself. How it was thrown into the sea and found floating in Tourlos Bay remains a mystery. In 1757 a major preservation and reconstruction of the Monastery was necessary. It lasted for 10 years, and it was at that time that the Iconostasis, the pulpit and the archbishop's throne were ordered. Another legend spins its yarn regarding the strangest fact that these items were ordered in Florence, Italy by an old Greek-Orthodox priest. Many years before, he had been there on some errand or other, and was so impressed by the rich life of the Roman-Catholic clergy, as compared to the Greek-Orthodox one, that he converted to Roman-Catholic. After serving the church for decades and having become very wealthy, he then changed his mind and asked the Archbishop in Constantinople what he could do to be accepted back into the Orthodox church. He was told that he had to rid himself of his sinful riches. Thus, he returned to Italy and ordered this magnificent Iconostasis from the masters in Florence, spending his last dimes on it. 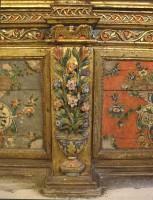 Some years later, the Iconostasis was brought from Italy and was installed in the church. 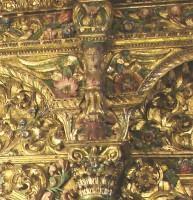 It is of carved wood, gold-plated, baroque style. The local people were stunned by its intricate sculptures, so far removed from the Byzantine tradition, but they agreed to accept the donation. Adding to their acceptance was the fact that they had long been exposed to western influence, due to the long co-existence with the Genoese and Venetian occupiers of the Aegean. This was not the only proof of Western influence, as the belfry was also Western style, and only much later was a Byzantine one erected beside it, thereby rendering this Monastery a rare exception to have belfries in both artistic styles. 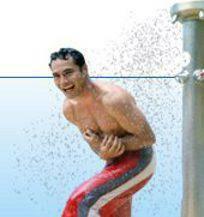 This is clearly shown in our photos. Nevertheless, we are not yet through with the Monastery’s Iconostasis. 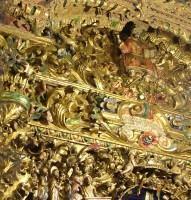 As soon as it was put in place, the monks, eager to protect it against smoke and insects, covered its entire surface with a thick layer of wax. This wax eventually absorbed the smoke of the burning candles and turned black. For centuries the Iconostasis was known to be black, and, curiously enough, its original state was forgotten by everybody. Some thirty years ago, a group of expert preservers came from Athens and set to work to return the Iconostasis to its former condition. It was with utmost astonishment that the result of their work was received, both by laic people and clergy alike. 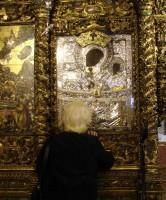 It is believed to be the best Iconostasis in the Eastern Mediterranean! Our photos convey only some of its beauty, and they are surely only second to one’s personal observation when visiting the Monastery! There is more worth noticing while visiting the Monastery: The sculpted marble fountain in its yard features a crowned figure, probably the Emperor of the Byzantine Empire, with the water coming out through his mouth. Under the church’s floor there is a crypt which houses the bones of the deceased monks, and atop the marble floor is a sculpted Byzantine Double-Headed Eagle, the emblem of the Byzantine Empire. The columns in the church are thought to have been brought here from the archaeological site of the nearby island of Delos, a marble quarry for centuries. Also worth seeing are the Icons on the Iconostasis, said to have been the work of “Ioannis from Corfu”; more post-Byzantine icons, of the Cretan School (with elongated extremities), established by El Greco (Domenicos Theotokopoulos), while he was still in his native land, Crete; the naïf style of the belfry, which, combined with the wrong spelling of the inscribed texts, are signs that these masterpieces are the work of humble local artisans and not educated scholars. The Monastery, besides that which we have already mentioned, contains collections of vintage tools, important relics, traditional canonicals, furniture, a marble baptistery, and much more. Fortified castle-like walls, with a protected hole (above the strong small gate), through which hot oil could be poured over attacking Muslim pirates. Funeral wreaths are arrayed against the wall; the church of Our Lady Tourliani inside the walls is the main church of the village of Ano Mera. This imposing construction challenges our comment to the previous photo: Which one is in fact more inpressive? It may be Greek to you, but to us Greeks it is misspelled Greek! It shows that the people who have built the Monastery and written the inscriptions were illiterate artisans. Such Iconostaseis, humble of of exquisite wealrh and sesign, like this one, are used to separate the Main Hall of Greek-Orthodox churches from the Sanctum Sanctorum which, according to a cryptic tradition going as backward in time as the Mysteries of Elephsis, cannot be open for everybody to see what the priests exactly do! 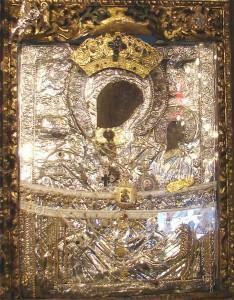 Mykonos, Ano Mera, The Holy Monastery of Our Lady Tourliani: To the right of the Main (or Emperial) Gate, we see the Holy Icon of Our Lady Tourliani, all silver and gold plated with offerings by the faithful. Such silver and gold offerings had accumulated in great numbers, in this church, as well as in Our Lady church on the nearby island of Tinos. In August 15th 1940, in peace time, while Tinos was celebrating the Dormition of Our Lady and the quays of the island were full with festive people, the Italian submarine Delfino torpedoed and sunk the Greek light cruiser Elli, docked along one of the quays. Almost one hundred people were killed and the shock was so big that the Churches of Our Lady on Tinos and Our Lady Tourliani on Mykonos offered to the Greek State most of their gold and silver offerings for Greece to order a new warship to replace the one sunk. Time, though, was not enough for this and the precious items, melt and kept at the Greek Treasury, were confiscated by the Nazi occupation forces when Greece was occupied. Under various pretensions post-war Germany failed to pay back for these treasures and for compensation of the many victims to the Nazi attrocities throughout Greece. Mykonos, Ano Mera, The Holy Monastery of Our Lady Tourliani: A silver masterpiece, offered to the church by a salvaged ship-owner, with the model of his sail-ship hanging under the chandelier.